Children don’t come with an instruction manual, but this parenting book is about as close as you can get. Written by a group of wise early-childhood development experts, it’s an easy-to-read behavioral guide to what’s going on in your young child’s mind in almost any situation – from public tantrums to noticing people with disabilities to preparing for the first day of preschool. Whether you read it cover to cover or reach for it when the going gets tough, it will help bring out that loving, nurturing, patient and resourceful parent that lives in all of us. 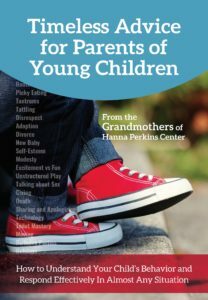 The authors are early childhood experts with long-standing connections with Hanna Perkins Center for Child Development. They are Maria Kaiser, M. Ed; Kathy Smith Baker, M. Ed. ;Georgianna (Gann) Roberts, M. Ed.Ginny Steininger, M. Ed; and Coordinator Barbara Streeter, M.S. (Bank Street), LPCC. Collectively, they have decades of experience and have helped several thousand children lead happier lives. The authors have generously donated all proceeds from the sale of this book to support operations at Hanna Perkins Center, a 501(c)3 non-profit entity. If you thought “Timeless Advice for Parents of Young Children” was useful, help other parents discover it by leaving a positive review.